This year the work at a rural hospital on the edge of the Serengeti was with a team comprised of two other herbalists, my wife Anne (gynecologist and surgeon) and two medical students from the University of Vermont. Herbalists Molly Hagan, Annie SewDev and myself worked on the inpatient wards, gathering daily case details and tracking patients’ improvement; we cared for wounds and trauma in the minor surgical theater (using only honey and botanical treatments, along with occasional iodine, lidocaine, and lots of gauze, tape and bandages); we harvested and processed many plants, notably Usnea, Lippia, Lantana, Eucalyptus, Zingiber, Opuntia, Ocimum, Galium, Acacia and Aloe; and collected samples of many more with the help of knowledgeable local folks. After a few days there, people started to seek us out where we were processing medicine: the guesthouse common space, where we had access to a blender, hotpot, and storage space for herbs. They were curious to see what the herbalists were doing, to share their thoughts on plant medicine, and to seek out our help for a range of complaints. One day my friend Joseph came over. He is a cheery man, always ready to engage in the long greeting ritual and exchange of news. We find a way to understand each other by making the best of our limited language skills – I get to practice my Swahili, he pulls out a little English. The answer to the standard “Habari?” (what news?) is always “nzuri” (good), and we began this way. But today, Joseph started to complain that he hadn’t been sleeping very well for some time: he was restless, waking up a lot, and not feeling refreshed. He works physically all day long, helping to tend the hospital grounds, and his workload had been particularly heavy as of late. I noticed an unexpected weakness in his pulse, and so we decided to walk him over to the stand of wild ashwagandha (Withania, called ol’asaiyet by the Maasai). 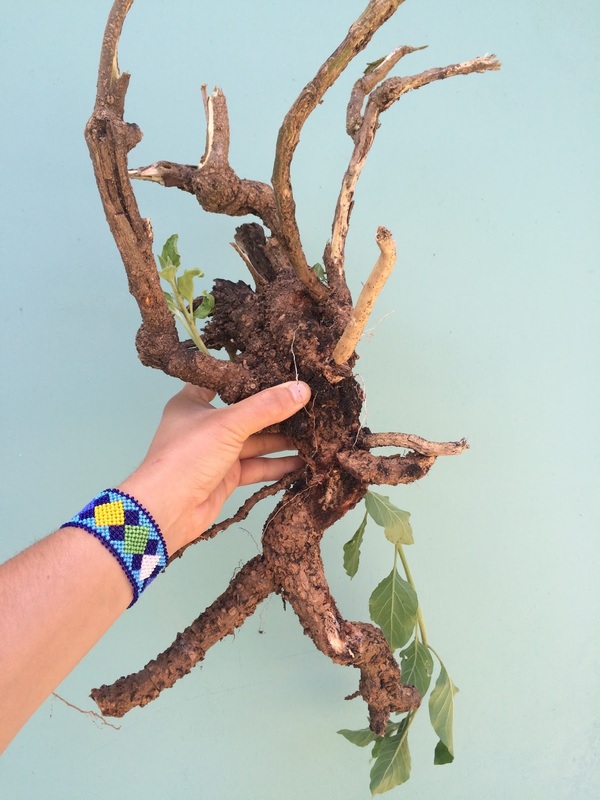 He dug up a huge, gnarled, very fragrant root and we instructed him to peel it and simmer some of the root bark in milk every evening (hot boiled milk, rich and super-creamy, is somewhat of a staple – and perfect for ashwagandha extraction). A few days later, I ran in to Joseph as he was cutting grass. He was using a sort of long, hooked metal blade – not quite a scythe, more of a blunt machete with a short 90 degree bend at the bottom. He would swing at the grass with this tool, chopping and flinging off big clumps of the tall weeds that grew between the hospital ward buildings and lawns. No wonder he was wiped out! This is tough work – but all the grass is cut this way, week after week, all around the hospital and the access road. Nevertheless, when I asked how he was doing, he said his sleep was much improved, he loved the ashwagandha, and felt like he had plenty of energy for his work. He smiled, gave me the thumbs up, and kept swinging at the grass. I was surprised, the next morning, to hear the loud, choppy sound of a small engine as I walked to our morning meeting. There was Joseph, somewhat awkwardly pushing a gas-powered lawnmower through the tall grass left unfinished from the day before. We smiled broadly at each other, and I thought to myself how this machine was really going to make my friend’s work easier. Granted, it was a little surreal to see the lawns, where the Maasai women sit every morning in the sun airing their red, black, and purple checkered cloaks, mowed in visible lines more characteristic of an American suburb. But still, I thought, maybe this is progress. Two days later, Joseph was back at it with the machete. I gave him a puzzled look, made a lawnmower-pushing motion with my arms, and asked “wapi?” (where?). He looked at me with a half-grin and said, simply, “kaput” (a pretty universal word for “broken”). I later learned that the belt had snapped, and that they had tried to repair it, to no avail. Perhaps a replacement could be found in Arusha, over 9 hours away, but one would have to coordinate purchase and delivery somehow. This was hard enough for medical supplies; I was skeptical that a new, functional belt would be arriving anytime soon. And so the lawnmower sat in the garage, like a fish out of water, its potential untapped because it was disconnected from the supply chain it needed for survival. It is important to contextualize any technology. Our tools, like everything else, do not exist outside of their environments, of the cultural and environmental niches they occupy. One cannot simply say “a lawnmower is great at cutting grass, let’s get one” and use it regardless of where the grass is growing. Joseph’s circumstances and environment are as important to the function of the lawnmower as is the gasoline it uses. Technology’s impacts and effectiveness cannot be measured in absolute terms: like anything else, the relationship and connections that technology has in any given situation have as much to do with how well it will work as the nuts and bolts of the technology itself. Sometimes tech is so powerful that it changes its environment: witness the widespread adoption of cell phones around the globe. Commerce has changed as a result. Maasai bomas (dwelling communities) install small solar panels for the sole purpose of charging their phones, so they can send funds back and forth and connect with friends and family. Still, the way the cell phone works in rural Tanzania is very different than how it works in America: even if a technology is powerful enough to alter its new environment, its expression is still bound to its context. Technology must be effectively integrated into its cultural and environmental context to be successful, sustainable, and non-damaging. Nowhere else is this more evident than in global development work. If our goal is to increase capacity, resilience, and sustainability in the developing world (or anywhere, really), we must consider context when discussing the application of technology. Consider the example of water: in East Africa, year-round water supply is essential. In the 1980s, when the country was still stable, my father (a geologist and soil engineer) worked in Somalia digging wells in desert areas, so local communities could have water security. I remember him (and my mother) being gone during all of Summer vacation. When he returned, he told stories of the fancy wells the Italian government had dug, only to have them break and be left, abandoned, after a few months’ use. He worked with local engineers to develop a pump system that relied on donkeys walking in circles, strapped to a central, rotating piston. Primitive? Perhaps. But much more effective and resilient in the context of East Africa. Here we had a merging of the modern and the ancient: sophisticated geological surveys found the water, drilling rigs accessed it, and donkeys kept the water flowing. This is integrated technology. While working on wound care and support at the Wasso district hospital, the team of herbalists was confronted with this reality every day. There are old, broken pieces of Western medical tech littered throughout the hospital: rusted, broken leg braces; dysfunctional surgical lights with no lightbulbs; ventilator bags with tape over the cracking plastic. So when there is an issue, we must find a solution not by bringing our technology (be it essential oils and tinctures, or laparoscopic surgery equipment), but by developing integrated technologies. Perhaps the best example of this was the improvised traction splint we made for a woman whose femur had been completely broken when she was hit by a car. 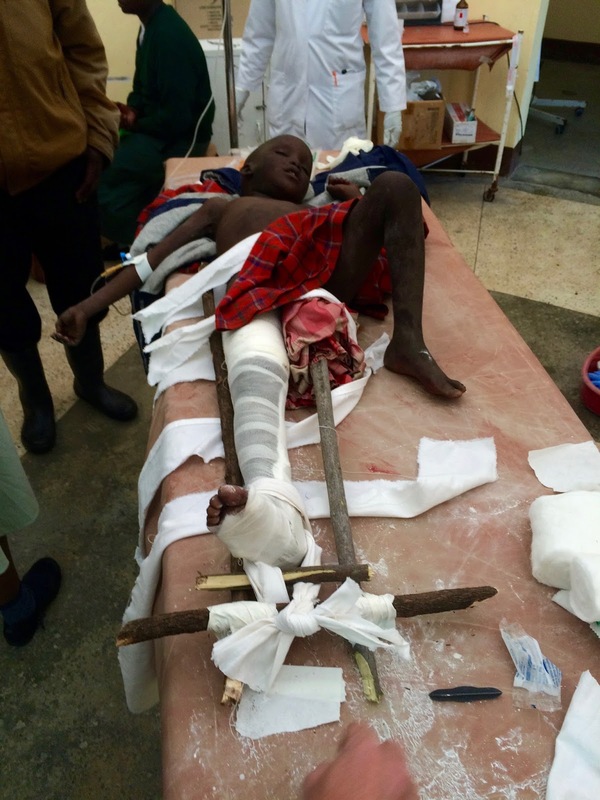 Hospital staff had applied a makeshift cast on the leg, but it didn’t even come up to the femur fracture. And now, because there are no orthopedic surgeons in Wasso, they were suggesting she get into a Land Rover and travel 9 hours to Arusha, the nearest facility that could properly set her bone. Now, the femur is the longest bone in the human body. It keeps the powerful quadriceps muscles stretched out, ready to help us walk, run and jump. But when it’s broken, the quads contract back, pulling the jagged edges of the fracture until they overlap and dig into muscle tissue, ripping vessels. Patients can lose huge amounts of blood inside their leg, risking compartment syndrome and even death. I’ve been on the road to Arusha – “bumpy” is a gross understatement. What this woman needed was traction: something to pull her ankle and pelvis apart with enough strength to counterbalance the quad’s contraction, so the two pieces of the femur would remain in line and separated, preventing them from destroying tissue. When we made this suggestion, staff laughed. “You cannot hold traction for the entire ride to Arusha,” they exclaimed. And they were right: the force needed to pull back against the quad requires two people, one at the ankle and the other at the armpits, pulling with all their might. What she needed was a traction splint: something to hold the tension and stabilize the femur at the same time. Of course, no such device exists at Wasso hospital. So, remembering my wilderness first responder training, we decided to make one. 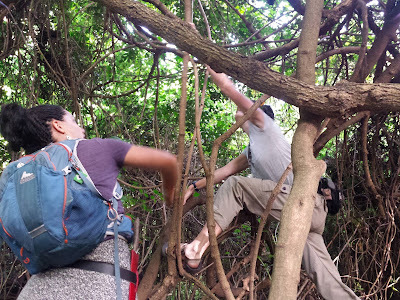 Molly, her Maasai sime (long machete) in hand, went out to hack off yellow-bark acacia limbs: one for the outside of the leg, up past the pelvis, and a shorter piece for the inside of the leg. She also fashioned a cross-member for the bottom of the splint and a smaller, “twisting stick” to increase and secure traction. I started tearing up a bedsheet into long strips to lash the splint together. Annie stayed with the patient and helped explain our plan to the hospital staff, who were now gathering around, very interested. Getting ready to apply traction. Molly at the shoulders, Annie and I get the splint ready. We lashed the outer and inner sticks to the cross-member (which was about 6 inches under the patient’s heel), padded the tip of the inner stick so it could rest comfortably in the crotch, and loosely tied a strip of bedsheet around her ankle. This strip was also secured to the cross-member, and the “twisting stick” slid between the loop just under the heel. Then, giving it all we had, Molly and I applied traction, pulling the femur bone apart so that the heel almost touched the cross-member while Annie turned the twisting stick to make sure there was no slack between the heel and the cross-member of the splint. Annie finished by tying the two sticks together, under the knee, above and below the fracture, and then placing a final belt around the outer stick and across the woman’s pelvis. Molly and I released traction – and the leg didn’t move. Success. We remarked to ourselves that we would probably never make another improvised traction splint. But never say never: just two days later, a seven-year-old boy came in to minor theater, having been trampled by an elephant. He was moving in and out of consciousness, and showed abrasions on his head, chest, and arms. But his pupils reacted, and when he was conscious, he could respond to commands well. So what concerned us most was the right leg, which was floppy and bleeding at mid-thigh from a compound femur fracture. We moved quickly, repeating our work (but this time on a smaller scale). After getting everything ready, we applied traction. Dr. Anne remarked that she heard a slight “pop” as the leg extended and the femur moved back into position. We secured the splint, and the boy was moved to the intensive care ward to await transfer to Arusha. In America, you can buy fancy traction splints. They are amazing, quick and super-effective. Our work was probably not as effective, but it did the job (especially considering the long car ride ahead for both patients). And it was simple enough to replicate: hospital staff can make similar splints now, and improve outcomes for those who come through Wasso. Similarly, hospital staff now uses honey and herbal treatment for wound care, and after extensive research this time around, we look forward to continuing to enhance the hospital’s portfolio of low-cost, effective herbal interventions that come from the local environment. These are sustainable, improve the hospital’s capacity to help others, and build independent capacity rather than dependence on Western intervention. These are integrated technologies. Yet another example of success building hospital capacity with integrated technology came from our partners, Dr. Anne Dougherty and medical students Sabrina Bedell and Melanie Ma. They followed pregnant women in the hospital, screened for gynecologic complaints, and performed surgery when necessary (using old-school, open laparotomy). They traveled to outreach clinic to perform prenatal checks and vaccinate babies against polio and other diseases. Beyond all this (including middle-of-the-night work on complicated deliveries), they worked a whole week of 16+ hour days screening women for breast cancer, HIV, and cervical cancer. In so doing, they also helped establish and cement a cervical cancer screening and treatment program at the hospital where none existed before. Cervical cancer is a huge problem in Tanzania. While in the US every year there are 7.5 cases out of 100,000 women, in Tanzania there are 54. Out of the 7,300 cases diagnosed in Tanzania in 2012, over 4,200 died. It is the leading cause of cancer-related deaths in Tanzania for women aged 15-44. One of the biggest reasons for the differences between the US and Tanzania is essentially an issue of integrated technology: in the US, frequent screenings and the pap smear have made early detection and treatment easy and effective. An abnormal pap brings a call from your physician, and you can decide on a range of treatment options, from herbal and nutritional strategies to LEEP procedures and beyond (depending on the nature of the problem), and come back for re-testing. But this technology just doesn’t work in East Africa: first of all, you need a pathology lab to analyze pap smears (there is one, but it’s nine hours away in Arusha). Secondly, after getting results, you need to find a way to inform the women, and get them to come back to the hospital (often hours, if not days, away) for treatment. This is difficult. As a result, if women are screened at all, they are often lost to follow-up and worrisome screening results are left untreated – until they return to the hospital with persistent vaginal bleeding and weight loss from advanced, invasive cancer. Our Western technology fails in this case, because the context in East Africa is so vastly different from the context in the US. The medical team relied on a simple, yet surprisingly effective combination of screening and treatment to circumvent these issues. First, the cervix is swabbed with a solution of simple white vinegar (available everywhere). After one minute, the cervix is examined. Any white lesions indicate a potential issue with cervical cells, most likely from dysplasia or early cancerous changes. If such lesions are found, staff performs cryotherapy: using compressed carbon dioxide gas, a metal tip is super-cooled and used to freeze off the top layer of cervical cells. The tip is relatively inexpensive, and can be re-used forever; the compressed CO2 can be flown in from Arusha and allows for between 25 and 30 cryotherapy treatments. This see-and-treat model completely bypasses the followup problem. And in the end, it saves lives (to read more, see this WHO report). Dr. Anne and her team screened over 300 women, treated almost 30 for pre-cancerous lesions, identified 6 others who needed more advanced treatment in Arusha, and discovered one case of invasive cancer. This last case was sad to hear about – but now, this screening program is established in Wasso, and such cases will hopefully be prevented in the future. This see-and-treat model may not be the gold standard in the US, but it is much more effective in East Africa. It builds sustainable capacity. It is a well-integrated technology. In all these examples, we see a few common threads. There is an awareness of the context in which the technologies are being applied: what’s the nature of the problem? Where does it live? What are the social, cultural, and environmental factors at play? There is also a focus on empowering the system, rather than building dependence. When Western resources are used, they are often just catalytic – the technology is meant to stand on its own. Finally, the solutions are built with resilience in mind: in the parlance of systems theory, all the examples described increase the system’s capacity for “disturbance rejection”. Integrated technologies are like herbal adaptogens: nutritive, gentle, familiar ways to enhance adaptability and build sustainable energy. I would argue that herbal medicine is a quintessential example of an integrated technology. It shows awareness of context, strives for empowerment rather than dependence, and increases resiliency (not only of the person taking the herbs, but also of the community that embraces herbal medicine). And to push a little further, let me suggest that context, in the case of medicine, means more than culture and environment: it means the ecosystem of diseases with which we struggle. Modern tech medicine sometimes loses awareness of this facet of context: cardiovascular disease, for example, is as different from acute infection as the Western woman is from the Maasai bibi. How can we develop truly integrated technologies for handling the chronic diseases of our culture? Part of the answer lies in letting go of labels like “advanced” and “primitive”. Let us think more about effectiveness, rather than pursuing new technology for its own sake. We may find that the plants that have evolved side-by-side with us for hundreds of thousands of years can help create a more sustainable, effective, and resilient system for medical care. In so many ways, and on so many levels, consuming plants is an exquisitely fine-tuned integrated technology. I am grateful to the people of Wasso, and the Wasso phytotherapy project, for reminding me of this with such simple clarity. I think that it's really all about the opportunity costs of first world problems. People are so small minded in their own small problems that they forget the junk in storage they keep could change and impact the lives of people less fortunate.